A table is the centre of any home, a place where the whole household gather for meals, chats and more. 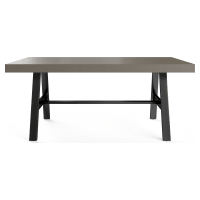 Whether it's a coffee, dining or side table, make yours a true statement piece by opting for a highly stylish concrete table. Strong and sturdy, a concrete table is a piece that is guaranteed to last. Designed to stand the test of time, these pieces are made for extended everyday use. 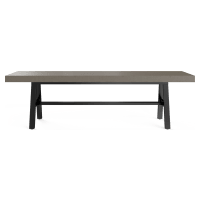 Take your pick from concrete tables in a range of styles and colours, with a spectrum of dark to lighter shades on offer. Often with a bold industrial edge, there are also concrete tables that have a more classic appeal. Whatever shape you are after, there is also a style to suit you. 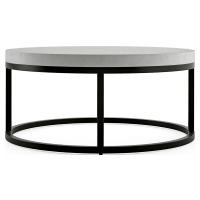 Everything from rectangular to square to circular concrete tables are available, so you can perfectly match the space you wish to style it in. Mixed high-quality materials have been used to craft each concrete table design. This includes polished wood, powder coated metal, and more. Each piece has undergone rigorous quality testing to ensure you have something that will last a lifetime. Match your concrete table with a range of dining chairs available in every style from Brosa, or see the complete concrete furniture or table collection for more options.